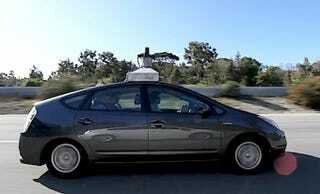 Are Google's Driverless Cars Legal? Google's project to design driverless vehicles raised several questions about the future of driving. But it also raised a more topical question: Are Google's heavily-modified driverless vehicle prototypes even legal? We found out. Researchers have been working on driverless vehicles since the late 1970s; European governments spent nearly $1 billion in the 1980s and '90s on automated vehicles, including a Mercedes sedan that passed other vehicles on the German autobahn in 1995 at speeds of 110 mph without human input. In revealing its project Sunday, Google said it had racked up nearly 140,000 miles in its vehicles on public roads, including the Pacific Coast Highway and famous spots such as San Francisco's twisty Lombard Street. The computing giant says it alerted local law enforcement officials whenever testing took place. According to California officials, there are no laws that would bar Google from testing such models, as long as there's a human behind the wheel who would be responsible should something go wrong. Google says its test vehicles always have at least three passengers: a driver behind the wheel and two technicians to monitor the software and systems. Google's software "would be just a big step up from cruise control," said Mike Marando, a spokesman for the California Department of Motor Vehicles. "If the vehicle goes too fast, or strays across the line, the human would be responsible for operating the car legally." And sadly, modern vehicles have been replacing drivers with technology for years. Adaptive cruise control is standard on many luxury models; Ford and Lexus vehicles can parallel park on their own with only brake inputs from the driver, and more advanced systems engage braking controls automatically if they sense a crash is imminent. For now, there's no legal limits keeping Google or other researchers from developing their cars on public roads as long as there's a human behind the wheel. Going beyond that will make the legal questions as challenging as the technical ones.